PVC Fences Buffalo Grove | Fence Installation | Fence Solutions Co.
Are you looking for durable, low-maintenance fencing that enhances your property’s curb appeal? 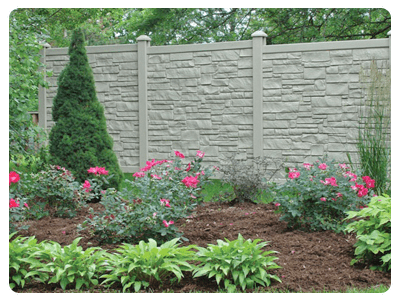 Choose the PVC fences of Fence Solutions Co. in Buffalo Grove, IL. We offer several styles of PVC fences in different sizes, textures, colors, and designs to help you achieve the look you want for your property. For your convenience, our PVC fences have a 5-Year Parts and Labor Warranty. PVC fences offer a plethora of variations that mimic different kinds of materials ranging from wood and steel to rocks. Whether you want rustic looking fencing or a smooth texture, PVC fences are the ideal, maintenance free solution for your fence design concerns. Just let us know what you are looking for, and we will go above and beyond to give you the fences you desire. Upgrade your property’s security and overall look with amazing fences from Fence Solutions Co. Check out our selection of wood, aluminum, and PVC fences today. If you wish to place an order for our products, inquire about our fence installation services, or hire us as your fencing contractor, feel free to contact our staff using the information provided.